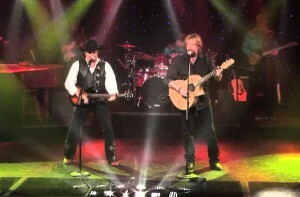 The MEGASTARS OF COUNTRY Show, featuring Larry Turner & Doug Brewin, is an exciting, fun-filled, live concert experience featuring tributes to country music’s legendary singers and songwriters: ALAN JACKSON, GEORGE STRAIT and BROOKS & DUNN, the legendary artists with 127 number one hits among them, not counting their other songs in the top ten! The MEGASTARS OF COUNTRY Show is a musical celebration of some of the greatest country music hits ever recorded and an amazing theatrical experience! What makes this show so extraordinary is that the show’s performers use their own natural voices and appearance to sound and look exactly like the real artists on stage in concert. From their mannerisms, vocals, and right down to their authentic stage costuming, the MEGASTARS OF COUNTRY Show covers every detail and captures the closest experience you’ll get to the real deal. This show has appeared across the USA to sold-out audiences, standing ovations and incredible reviews! The show includes the Smokin’ Hot “Late Nite Rodeo Band”. This entry was posted in All Talent, Regional and tagged Country by admin. Bookmark the permalink.